After falling out of favor for many years, cooking and garnishing with flowers is back in vogue once again. Flower cookery has been traced back to Roman times, and to the Chinese, Middle Eastern, and Indian cultures. Edible flowers were especially popular in the Victorian era during Queen Victoria’s reign. Today, many restaurant chefs and innovative home cooks garnish their entrees with flower blossoms for a touch of elegance. The secret to success when using edible flowers is to keep the dish simple, do not add to many other flavors that will over power the delicate taste of the flower. Today this nearly lost art is enjoying a revival. Please use this Edible Flowers Chart before eating any flowers. 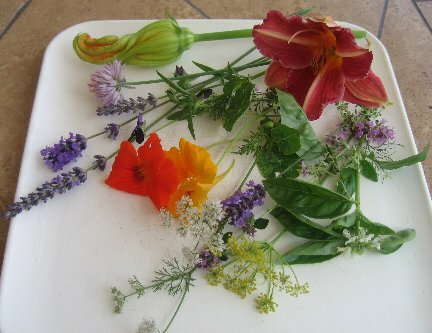 Photo of edible flowers picked in Linda’s garden in July (lavender, thyme, dill, cilantro, day lily, squash blossom, Nasturtiums, chives, and basil). BEFORE CONSUMING ANY PLANT OR FLOWER, CHECK WITH A MEDICAL OR PLANT PROFESSIONAL. NOT EVERY FLOWER/PLANT IS EDIBLE – In fact, sampling some flowers can make you very, very sick. You also should NEVER use pesticides or other chemicals on any part of any plant that produces blossoms you plan to eat. Never harvest flowers growing by the roadside. Identify the flower exactly and eat only edible flowers and edible parts of those flowers. Always remember to use flowers sparingly in your recipes due to the digestive complications that can occur with a large consumption rate. Most herb flowers have a taste that’s similar to the leaf, but spicier. The concept of using fresh edible flowers in cooking is not new. Tuberous Begonias (Begonia X tuberosa) – The leaves, flowers, and stems are edible. Begonia blossoms have a citrus-sour taste. The petals are used in salads and as a garnish. Stems, also, can be used in place of rhubarb. The flowers and stems contain oxalic acid and should not be consumed by individuals suffering from gout, kidney stones, or rheumatism. Wax Begonias (Begonia cucullata) – The fleshy leaves and flowers are edible raw or cooked. They can have a slight bitter after taste and if in water most of the time, a hint of swamp in their flavor. Carnations (Dianthus caryophyllus – aka Dianthus) – Carnations can be steeped in wine, candy, or use as cake decoration. To use the surprisingly sweet petals in desserts, cut them away from the bitter white base of the flower. Dianthus are the miniature member of the carnation family with light clove-like or nutmeg scent. Petals add color to salads or aspics. Carnation petals are one of secret ingredients that has been used to make Chartreuse, a French liqueur, since the 17th century. Chrysanthemums (Chrysanthemum coronarium) – Tangy, slightly bitter, ranging in colors from red, white, yellow and orange. They range in taste from faint peppery to mild cauliflower. They sould be blanched first and then scatter the petals on a salad. The leaves can also be used to flavor vinegar. Always remove the bitter flower base and use petals only. Young leaves and stems of the Crown Daisy, also known as Chop Suey Greens or Shingiku in Japan, are widely used in oriental stir-fries and as salad seasoning. Clover (Trifolium species) – Sweet, anise-like, licorice. White and red clover blossoms were used in folk medicine against gout, rheumatism, and leucorrhea. It was also believed that the texture of fingernails and toenails would improve after drinking clover blossom tea. Native Americans used whole clover plants in salads, and made a white clover leaf tea for coughs and colds. Avoid bitter flowers that are turning brown, and choose those with the brightest color, which are tastiest. Raw flower heads can be difficult to digest. Cornflower (Centaurea cynaus) – Also called Bachelors button. They have a slightly sweet to spicy, clove-like flavor. Bloom is a natural food dye. More commonly used as garnish. Dame’s Rocket (Hesperis matronalis) – Also called Sweet Rocket or Dame’s Violet. This plant is often mistaken for Phlox. Phlox has five petals, Dame’s Rocket has just four. The flowers, which resemble phlox, are deep lavender, and sometimes pink to white. The plant is part of the mustard family, which also includes radishes, broccoli, cabbage, cauliflower, and, mustard. The plant and flowers are edible, but fairly bitter. The flowers are attractive added to green salads. The young leaves can also be added to your salad greens (for culinary purposes, the leaves should be picked before the plant flowers). The seed can also be sprouted and added to salads. NOTE: It is not the same variety as the herb commonly called Rocket, which is used as a green in salads. Dandelions (Taraxacum officinalis) – Member of the Daisy family. Flowers are sweetest when picked young. They have a sweet, honey-like flavor. Mature flowers are bitter. Dandelion buds are tastier than the flowers: best to pick these when they are very close to the ground, tightly bunched in the center, and about the size of a small gumball. Good raw or steamed. Also made into wine. Young leaves taste good steamed, or tossed in salads. When serving a rice dish use dandelion petals like confetti over the rice. Day Lilies (Hemerocallis species) – Slightly sweet with a mild vegetable flavor, like sweet lettuce or melon. Their flavor is a combination of asparagus and zucchini. Chewable consistency. Some people think that different colored blossoms have different flavors. To use the surprisingly sweet petals in desserts, cut them away from the bitter white base of the flower. Also great to stuff like squash blossoms. Flowers look beautiful on composed salad platters or crowning a frosted cake. Sprinkle the large petals in a spring salad. In the spring, gather shoots two or three inches tall and use as a substitute for asparagus. NOTE: Many Lilies contain alkaloids and are NOT edible. 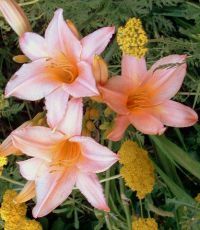 Day Lilies may act as a diuretic or laxative; eat in moderation. English Daisy (Bellis perennis) – The flowers have a mildly bitter taste and are most commonly used for their looks than their flavor. The petals are used as a garnish and in salads. Fuchsia (Fuchsia X hybrida) – Blooms have a slightly acidic flavor. Explosive colors and graceful shape make it ideal as garnish. The berries are also edible. Garden Sorrel (Rumex acetosa) – Sorrel flowers are tart, lemon tasting. So use like a lemon: on pizza, a salad topping, in sauces, over cucumber salads. Gladiolus (Gladiolus spp) – Flowers (anthers removed) have a nondescript flavor (taste vaguely like lettuce) but make lovely receptacles for sweet or savory spreads or mousses. Toss individual petals in salads. It can also be cooked like a day lily. Hibiscus (Hibiscus rosa-sinensis) – Cranberry-like flavor with citrus overtones. Use slightly acidic petals sparingly in salads or as garnish. The flower can be dried to make an exotic tea. Hollyhock (Alcea rosea) – Very bland tasting flavor. Honeysuckle (Lonicera japonica) – Sweet honey flavor. Only the flowers are edible. NOTE: Berries are highly poisonous – Do not eat them! Impatiens (Impatiens wallerana) – The flowers have a sweet flavor. They can be used as a garnish in salads or floated in drinks. Johnny-Jump-Ups (Viola tricolor) – Lovely yellow, white and purple blooms have a mild wintergreen flavor and can be used in salads, to decorate cakes, or served with soft cheese. They are also a great addition to drinks, soups, desserts or salads. Lilac (Syringa vulgaris) – The flavor of lilacs varies from plant to plant. Very fragramt, slightly bitter. Has a distinct lemony taste with floral, pungent overtones. Great in salads and crystallized with egg whites and sugar. Linden (Tilla spp.) – Small flowers, white to yellow was are delightfully fragrant and have a honey-like flavor. The flowers have been used in a tea as a medicine in the past. NOTE: Frequent consumption of linden flower tea can cause heart damage. Marigold (Tagetes tenuifolia – aka T. signata) – The marigold can be used as a substitute for saffron. Also great in salads as they have a citrus flavor. Nasturtiums Tropaeolum majus) – Comes in varieties ranging from trailing to upright and in brilliant sunset colors with peppery flavors. Nasturtiums rank among most common edible flowers. Blossoms have a sweet,spicy flavor similar to watercress. Stuff whole flowers with savory mousse. Leaves add peppery tang to salads. Pickled seed pods are less expensive substitute for capers. Use entire flowers to garnish platters, salads, cheese tortas, open-faced sandwiches, and savory appetizers. Pansy (Viola X wittrockiana) – Pansies have a slightly sweet green or grassy flavor. If you eat only the petals, the flavor is extremely mild, but if you eat the whole flower, there is a winter, green overtone. Use them as garnishes, in fruit salads, green salad, desserts or in soups. Phlox, Perrennial Phlox (Phlox paniculata) – It is the perennial phlox, NOT the annual, that is edible. It is the high-growing (taller) and not the low-growing (creeping) phlox that grows from 3 to 4 feet tall. Slightly spicy taste. Great in fruit salads. The flowers vary from a Reddish purple to pink, some white. Pineapple Guave (Feijoa sellowians) – The flavor is sweet and tropical, somewhat like a freshly picked ripe papaya or exotic melon still warm from the sun. Primrose (Primula vulgaris) – Also know as Cowslip. This flower is colorful with a sweet, but bland taste. Add to salads, pickle the flower buds, cook as a vegetable, or ferment into a wine. Queen Anne’s Lace (Daucus carota) – Also known as Wild Carrot and Bishop’s Lace. It is the original carrot, from which modern cultivars were developed, and it is edible with a light carrot flavor. The flowers are small and white, and bloom in a lacy, flat-topped cluster. Great in salads. NOTE: The problem is, it is closely related to, and looks almost exactly like another wild plant, Wild or Poison Hemlock, which often grows profusely in similar habitats, and is said to be the most poisonous plant native to the United States. The best way to differentiate between the two plants is to remember that Queen Anne’s Lace has a hairy stem, while the stems of Wild Hemlock are smooth and hairless and hollow with purple spots. Scented Geraniums (Pelargonium species) – The flower flavor generally corresponds to the variety. For example, a lemon-scented geranium would have lemon-scented flowers. They come in fragrances from citrus and spice to fruits and flowers, and usually in colors of pinks and pastels. Sprinkle them over desserts and in refreshing drinks or freeze in ice cubes. NOTE: Citronelle variety may not be edible. Snap Dragon (Antirrhinum majus) – Delicate garden variety can be bland to bitter. Flavors depend on type, color, and soil conditions. Probably not the best flower to eat. Sunflower (Helianthus annus) – The flower is best eaten in the bud stage when it tastes similar to artichokes. Once the flower opens, the petals may be used like chrysanthemums, the flavor is distinctly bittersweet. The unopened flower buds can also be steamed like artichokes. Tulip Petals (Tulipa) – Flavor varies from tulip to tulip, but generally the petals taste like sweet lettuce, fresh baby peas, or a cucumber-like texture and flavor. NOTE: Some people have had strong allergic reactions to them. If touching them causes a rash, numbness etc. Don’t eat them! Don’t eat the bulbs ever. If you have any doubts, don’t eat the flower. Violets (Viola species) – Sweet, perfumed flavor. Related flowers, Johnny jump-ups or violas, and pansies now come in colorful purples and yellows to apricot and pastel hues. I like to eat the tender leaves and flowers in salads. I also use the flowers to beautifully embellish desserts and iced drinks. Freeze them in punches to delight children and adults alike. All of these flowers make pretty adornments for frosted cakes, sorbets, or any other desserts, and they may be crystallized as well. Heart-shaped leaves are edible, and tasty when cooked like spinach. Yucca Petals (Yucca species) – The white Yucca flower is crunchy with a mildly sweet taste (a hint of artichoke). In the spring, they can be used in salads and as a garnish. Apple Blossoms (Malus species) – Apple Blossoms have a delicate floral flavor and aroma. They are a nice accompaniment to fruit dishes and can easily be candied to use as a garnish. NOTE: Eat in moderation as the flowers may contain cyanide precursors. The seeds of the apple fruit and their wild relations are poisonous. Banana Blossoms (Musa paradisiaca) – Also know as Banana Hearts. The flowers are a purple-maroon torpedo shaped growth appears out of the top of usually the largest of the trunks. Banana blossoms are used in Southeast Asian cuisines. The blossoms can be cooked or eaten raw. The tough covering is usually removed until you get to the almost white tender parts of the blossom. It should be sliced and let it sit in water until most of the sap are gone. If you eat it raw, make sure the blossom comes from a variety that isn’t bitter. Most of the Southeast Asian varieties are not bitter. Citrus Blossoms (orange, lemon, lime, grapefruit, kumquat) – Use highly scented waxy petals sparingly. Distilled orange flower water is characteristic of Middle Eastern pastries and beverages.Citrus flavor and lemony. Elderberry Blossoms (Sambucus spp) – The blossoms are a creamy color and have a sweet scent and sweet taste. When harvesting elderberry flowers, do not wash them as that removes much of the fragrance and flavor. Instead check them carefully for insects. The fruit is used to make wine. The flowers, leaves, berries, bark and roots have all been used in traditional folk medicine for centuries. NOTE: All other parts of this plant, except the berries, are mildly toxic! They contain a bitter alkaloid and glycoside that may change into cyanide. The cooked ripe berries of the edible elders are harmless. Eating uncooked berries may cause nausea, vomiting, and diarrhea. Alliums (leeks, chives, garlic, garlic chives) – Known as the “Flowering Onions.” There are approximately four hundred species that includes the familiar onion, garlic, chives, ramps, and shallots. All members of this genus are edible. Their flavors range from mild onions and leeks right through to strong onion and garlic. All parts of theplants are edible. The flowers tend to have a stronger flavor than the leaves and the young developing seed-heads are even stronger. We eat the leaves and flowers mainly in salads. The leaves can also be cooked as a flavoring with other vegetables in soups, etc. Chive Blossoms (Allium schoenoprasum) – Use whenever a light onion flavor and aroma is desired. Separate the florets and enjoy the mild, onion flavor in a variety of dishes. Garlic Blossoms (Allium sativum) – The flowers can be white or pink, and the stems are flat instead of round. The flavor has a garlicky zing that brings out the flavor of your favorite food. Milder than the garlic bulb. Wonderful in salads. Angelica (Angelica archangelica) – Depending on the variety, flower range from pale lavender-blue to deep rose. It has a flavor similar to licorice. Angelica is valued culinary from the seeds and stems, which are candied and used in liqueurs, to the young leaves and shoots, which can be added to a green salad. Because of its celery-like flavor, Angelica has a natural affinity with fish. The leaves have a stronger, clean taste and make a interesting addition to salads. In its native northern Europe, even the mature leaves are used, particularly by the Laplanders, as a natural fish preservative. Many people in the cold Northern regions such as Greenland, Siberia, and Finland consider Angelica a vegetable, and eat the stems raw, sometimes spread with butter. Young leaves can be made into a tea. them of root beer. The blossoms make attractive plate garnishes and are often used in Chinese-style dishes. Excellent in salads. Bee Balm (Monarda didyma) – Also called Wild Bergamot, Wild Oswego Tea, Horsemint, Monarda. Wild bee balm tastes like oregano and mint. The taste of bee balm is reminiscent of citrus with soft mingling of lemon and orange. The red flowers have a minty flavor. Any place you use oregano, you can use bee balm blossoms. The leaves and flower petals can also be used in both fruit and regular salads. The leaves taste like the main ingredient in Earl GrayTea and can be used as a substitute. Borage (Borago officinalis) – Has lovely cornflower blue star-shaped flowers. Blossoms and leaves have a cool, faint cucumber taste. Wonderful in punches, lemonade, gin and tonics, sorbets, chilled soups, cheese tortas, and dips. Burnet (Sanquisorba minor – The taste usually is likened to that of cucumbers, and burnet can be used interchangeably with borage. Chervil (Anthriscus cerefolium) – Chervil flowers are delicate white flowers with an anise flavor. Chervil’s flavor is lost very easily, either by drying the herb, or too much heat. That is why it should be added at the end of cooking or sprinkled on in its fresh, raw state in salads. Chicory (Cichorium intybus) – Earthy flavor, eat either the petals or the buds. Chicory has a pleasant, mild-bitter taste that has been compared to endive. The buds can be pickled. Cilantro/Coriander (Coriander sativum) – Like the leaves and seeds, the flowers have a strong herbal flavor. Use leaves and flowers raw as the flavor fades quickly when cooked. Sprinkle to taste on salads, bean dishes, and cold vegetable dishes. Fennel (Foeniculum vulgare) – It has a star-burst yellow flowers that have a mild anise flavor. Use with desserts or cold soups, or as a garnish with your entrees. Ginger (Zingiber officinale) – The white variety of ginger is very fragrant and has a gingery taste on the tongue. Petals may be eaten raw or you can cook the tender young shoots. Jasmine (jasmine officinale) – The flowers are intensely fragrant and are traditionally used for scenting tea. True Jasmine has oval, shiny leaves and tubular, waxy-white flowers. NOTE: The false Jasmine is in a completely different genus, “Gelsemium”, and family, “Loganiaceae”, is considered too poisonous for human consumption. This flower has a number of common names including yellow jessamine or jasmine, Carolina jasmine or jessamine, evening trumpet flower, gelsemium, and woodbine. Lavender (Lavandula angustifolia) – Sweet, floral flavor, with lemon and citrus notes. Flowers look beautiful and taste good too in a glass of champagne, with chocolate cake, or as a garnish for sorbets or ice creams. Lavender lends itself to savory dishes also, from hearty stews to wine-reduced sauces. Diminutive blooms add a mysterious scent to custards, flans or sorbets. NOTE: Do not consume lavender oil unless you absolutely know that it has not be sprayed and is culinary safe. Lemon Verbena (Aloysia triphylla) – Tiny cream-colored citrus-scented blossoms. 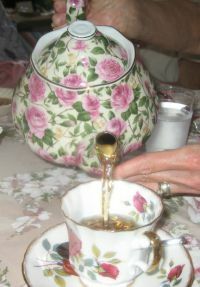 Leaves and flowers can be steeped as an herbtea, and used to flavor custards and flans. Marjoram (Origanum majorana) – Flowers are a milder version of plant’s leaf. Use as you would the herb. Mint (Mentha spp) – The flavor of the flowers are minty, but with different overtones depending on the variety. Mint flowers and leaves are great in Middle Eastern dishes. Oregano (Origanum vulgare) – Milder version of plant’s leaf. Use as you would the herb. Safflower (Carthamus tinctorius) – The dried flowers, Mexican saffron, are used as a food colorant in place of the more aromatic and expensive Spanish saffron. Sage (Salvia officinalis) – The flowers are violet-blue, pink or white up to 1 3/8 inches long, small, tubelike, clustered together in whorls along the stem tops. Flowers have a subtler sage taste than the leaves and can be used in salads and as a garnish. Flowers are a delicious companion to many foods including beans, corn dishes, sauteed or stuffed mushrooms, or pesto sauce. Savory (Satureja hortensis) – The flavor of the flowers is somewhat hot and peppery and similar to thyme. Thyme (Thymus spp.) – Milder version of leaf. Use sprigs as garnish or remove flowers and sprinkle over soups, etc. Use thyme anywhere a herb might be used. Did you know that broccoli, cauliflower, and artichokes are all flowers? Also the spice saffron is the stamen from the crocus flower? Capers are unopened flower buds to a bush native in the Mediterranean and Asian nations. The general rule is that the flowers of most vegetables and herbs are safe to eat. Always check first, because as with anything in life, there will always be exceptions. NOTE: Avoid – the flowers of tomato, potato, eggplant, peppers and asparagus. Arugula (Eruca vesicaria) – Also called garden rocket, roquette, rocket-salad, Oruga, Rocketsalad, rocket-gentle; Raukenkohl (German); rouquelle (French); rucola (Italian). An Italian green usually appreciated raw in salads or on sandwiches. The flowers are small, white with dark centers and can be used in the salad for a light piquant flavor. The flowers taste very similar to the leaves and range in color from white to yellowish with dark purple veins. Arugula resembles radish leaves in both appearance and taste. Leaves are compound and have a spicy, peppery flavor that starts mild in young leaves and intensifies as they mature. Artichoke (Cynara scolymus) – The artichoke is considered a flower in which the leaves of the flower are eaten and the choke or thistle part is discarded. Broccoli Florets (Brassica oleracea) – The top portion of broccoli is actually flower buds. As the flower buds mature, each will open into a bright yellow flower, which is why they are called florets. Small yellow flowers have a mild spiciness (mild broccoli flavor), and are delicious in salads or in a stir-fry or steamer. Corn Shoots (Zea mays) – Corn shoots may be eaten when they resemble large blades of grass with a strong sweet corn flavor, which could be used as a garnish for a corn chowder. The whole baby corn in husk may also be eaten, silk and all. Okra (Abelmoschus esculentus) – Also known as Ochro, Okoro, Quimgombo, Quingumbo, Ladies Fingers and Gumbo. It has hibiscus-like flowers and seed pods that, when picked tender, produce a delicious vegetable dish when stewed or fried. When cooked it resembles asparagus yet it may be left raw and served in a cold salad. The ripe seeds have been used as a substitute for coffee; the seed can be dried and powdered for storage and future use. Pac Choy (Brassica chinensis) – A sister of the Broccoli plant. Pea Blossoms (Pisum species) – Edible garden peas bloom mostly in white, but may have other pale coloring. The blossoms are slightly sweet and crunchy and they taste like peas. The shoots and vine tendrils are edible, with a delicate, pea-like flavor. Here again, remember that harvesting blooms will diminish your pea harvest, so you may want to plant extra. NOTE: Flowering ornamental sweet peas are poisonous – do not eat. Radish Flowers (Raphanus sativus) – Depending on the variety, flowers may be pink, white or yellow, and will have a distinctive, spicy bite (has a radish flavor). Best used in salads. The Radish shoots with their bright red or white tender stalks are very tasty and are great sautd or in salads. Scarlet Runner Beans (Phaseolus vulgaris) – Have brilliant red blooms that are very tasty and can be served as a garnish for soups, in salads. Bean pods toughen as they age, so makeuse of young pods as well as flowers. Squash Blossoms (Curcubita pepo) – Squash and pumpkin blossoms are edible and taste mildly of raw squash. Prepare the blossoms by washing and trimming the stems and remove the stamens. Squash blossoms are usually taken off the male plant, which only provides pollen for the female. IMPORTANT – Some dos and don’ts! Eat flowers only when you are positive they are edible. If uncertain, consult a good reference book on edible flowers prior to consumption. If pesticides are necessary, use only those products labeled for use on edible crops. No flowers is safe to eat unless it was grown organically. Wash all flowers thoroughly before you eat them. Introduce flowers into your diet in small quantities one species at a time. Too much of a good thing may cause problems for your digestive system. 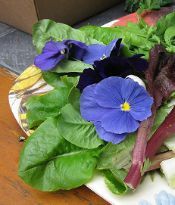 Eat only the flower petals for most flowers except pansies violas, and Johnny-jump-ups (in which they add flavor). If you have allergies, introduce edible flowers gradually, as they may aggravate some allergies. Do not eat flowers from florists, nurseries or garden centers. In many cases these flowers have been treated with pesticides not labeled for food crops. Do not eat flowers picked from the side of the road. Once again, possible herbicide use eliminates these flowers as a possibility for use. Just because flowers are served with food served at a restaurant does not mean they are edible. Know your edible flowers – as some chefs do not. It’s easy and very attractive to use flowers for garnish on plates or for decoration, but avoid using non-edible flowers this way. Many people believe that anything on the plate can be eaten. They may not know if the flower is edible or not and may be afraid to ask. Remove the stamens and styles from the flowers before eating. The pollen can detract from the flavor of the flower. In addition, the pollen may cause an allergic reaction in some individuals. Remove the sepals of all flowers except violas, Johnny-jump-ups, and pansies. Only the petals of some flowers such as rose, calendula, tulip, chrysanthemum, yucca, and lavender are edible. When using just the petals, separate them from the rest of the flower just prior to use to keep wilting to a minimum. Others, including Johnny-jump-up, violet, runner bean, honeysuckle, and clover can be eaten in their entirety. Roses, dianthus, English daisies, marigolds and chrysanthemums have a bitter white portion at the base of the petal where it was attached to the flower. Cut off the bitter part off the petal before using. After having removed the stamen, wash the flowers under a fine jet of water or in a strainer placed in a large bowl of water. Drain and allow to dry on absorbent paper. The flowers will retain their odor and color providing they dry quickly and that they are not exposed to direct sunlight. To preserve flowers, put them on moist paper and place together in a hermetically-sealed container or in plastic wrapping. This way, certain species can be preserved in the refrigerator for some 10 days. If the flowers are limp, they can be revitalized by floating them on icy water for a few moments; don’t leave too long or else they will lose some of their flavor. You can also store the whole flower in a glass of water in the refrigerator overnight. Recipe by Linda Stradley and Ellen Easton ©All Rights Reserved. Crystallized Edible Flower Photo by Ellen Easton ©All Rights Reserved from her Victorian Tea Menu. Candied flowers and petals can be used in a variety of imaginative ways – to decorate cakes large and small – all kinds of sweet things, such as ice cream, sherbet, cremes, fruit salads, and cocktails. Carefully clean and completely dry the flowers or petals. Beat the egg white in the small bowl until slightly foamy, if necessary add a few drops of water to make the white easy to spread. Paint each flower individually with beaten egg white using the small paintbrush. When thoroughly coated with egg white, sprinkle with superfine sugar. Place the coated flowers or petals on wax paper on a wire rack. Let dry at room temperature (this could take 12 to 36 hours). To test for dryness, check the base of the bloom and the heart of the flower to make sure they have no moisture. Flowers are completely dry when stiff and brittle to the touch. NOTE: To hasten drying, you may place the candied flowers in an oven with a pilot light overnight, or in an oven set at 150 degrees to 200 degrees F. with the door ajar for a few hours. Store the flowers in layers, separated by tissue paper, in an airtight container at room temperature until ready to use. The cheese can be prepared 24 hours in advance of serving. Use flat chunks of cheese, with edible rinds, in a variety of shapes. (Cheddar, Jack, Brie, or Camembert, in round, wedge, or square shapes). Lay the flowers and herbs flat on top of the cheese in the presentation that you want to display. Then remove the flowers and herbs, lay them aside in the pattern you want to display them. Place the cheese in a dish to catch the drippings from your glaze. Spoon the glaze over the cheese and spread evenly. After a few minutes it will become tacky to the touch, then you can “paste” on your flowers in the design pattern you planned. Refrigerate about 15 minutes; then remove from refrigerator and spoon more glaze over the flowers. NOTE: Make as many layers of glaze as necessary to cover your decorations – can be three layers for a thick design. If the glaze thickens up too much, just reheat and replace in ice. Serve with crackers. * All roses that you intend to consume must be free of pesticides. Do not eat flowers from florists, nurseries, or garden centers. In many cases these flowers have been treated with pesticides not labeled for food crops. The tastiest roses are usually the most fragrant. Clip and discard bitter white bases from the rose petals; rinse petals thoroughly and pat dry In a small saucepan over medium-high heat, place the prepared rose petals. Cover with water and bring just to a simmer; let simmer for approximately 5 minutes, or until the petals become discolored (darkened). Gently rinse your pesticide-free flower blossoms. Boil water for 2 minutes for all the air trapped in the water to escape. Remove from heat and let the water cool until room temperature. NOTE: This will ensure that the ice cubes are crystal clear. Place each blossom at the base of each individual compartment within an ice tray. Fill each compartment half full with the cooled boiled water and freeze. After the water is frozen solid, fill each ice cube compartment the rest of the way to the top with the remaining boiled water. Freeze until ready to use. In a saucepan over medium heat, add the water or rosewater, sugar, and edible flower petals; bring to a boil and let boil for approximately 10 minutes or until thickened into syrup. Remove from heat. Strain through cheesecloth into a clean glass jar. Makes about 2 to 3 cups syrup. Finely chop flower petals and mix into softened butter. Allow the mixture to stand at room temperature overnight to allow the flavors to fuse. Chill for a couple of weeks or freeze for several months. Learn how to make Lavender Jelly. Disclaimer: The author, Linda Stradley, and What’s Cooking America have researched all the mentioned edible flowers. However, individuals consuming the flowers, plants, or derivatives listed on this web page, do so entirely at their own risk. Neither the authors or What’s Cooking America can be held responsible for any adverse reaction to the flowers. I THANK YOU for doing this site as i was wondering about using some flowers< now i know that its OK so once again I thank you. Thank you for posting this. Lovely to find such concise work. Very helpful for those who want to grow safe plants in areas where children might try to eat them. From my experience, all Begonia species are edible in their entirety. A very comprehensive list! Thanks for the info. My search to find edible flowers in the U.S. has proven to be non-productive. Can you tell me where I may purchase edible flowers in the U.S. New Zealand have a wonderful edible flower package, but I would like somewhere close to me. Never take anyone’s word for what is edible. Too many plants appear differently under various conditions (lightening, growth cycle, etc). Also, if you are in as County, State, National Park, you need a permit to take samples. Especially if the plants are endemic to the area. Thank you for such great and useable information. I have an Aloysia virgata (Sweet Almond Tree Verbena). It’s kin to Lemon Verbena. Does anyone know if the flowers are eatable? The smell is heavenly. Thanks for catching the spelling error, this has been fixed. I’m very far from an expert on this, but farmers in my area have assured me that pesticides on a plant don’t last forever. Overtime, the pesticides get broken down by sunlight and water. Generally, the chemicals in the pesticide get broken down into smaller and smaller ‘pieces’ until only carbon dioxide, water, and minerals are left. I’ve been told by these same farmers that a pesticide is measured in ‘half-lives’, which is how long it takes for the potency of a pesticide to be reduced by half (again, which happens as particles get broken down by sunlight, water, etc). Five half lives is considered safe to eat (so if a half life of a pesticide was deemed 7 days, you could arguably eat it in 35). I’ve yet to find reassurance of this fact on the internet, but I’ve got a feeling these old farmers know what they’re talking about. Again, I’m no expert on pesticides but I don’t know of any that would last five years, so I’d say you’re good to go! Thank you for creating this most informative, inspiring and beautiful website! Are crepe myrtle petals edible? This web site is now 20 years old. New content is always being added. Any information on distillation of flower petals in water to produce flavored or aromatic waters (such as rosewater)? This comes from a book called Identifying and Harvesting Edible and Medicinal Plants by “Wildman” Steve Brill with Evelyn Dean. This is specifically about roses on page 160. use a deep glass or enamel pot with a round lid. 1 quart hot water, 1 pound of petals. Place a bowl with ice in it in the pot not touching the water. put the lid on upside down and put more ice in the lid. Set the pot to medium heat. The water mixes with the petals, produces steam, will condense on the lid then roll down to the middle and into the bowl. Only take 1 cup per pound of petals. Because the ice cools it, the volatile oils don’t get destroyed. Thank-you for the abundant information. You answered a question regarding Lonicera honeysuckle, which has begun to bloom here. Question being – is it edible? Yes (I’m chewing a blossom as I write this). The size is similar to the Rosemary blossoms that we’ve been enjoying for a couple weeks now (I have a small greenhouse). I have used the blossoms on deviled and scrambled eggs and today on a turkey sandwich. Thank-you again for providing all this information! Hello, I am grateful to this informative Edible Flower chart. I was wondering if you minded if I quote briefly from it in an upcoming recipe post and then link directly to this post. Thank you! Are the flowers of Jerusalem Artichokes edible? Some of these, such as peonies, are poisonous. Not poisonous enough to kill an adult, but poisonous enough to make them sick. I’m unsure if boiling the peonies degrades the poison, but certainly do not eat them raw as the author suggests. Primrose also can cause sever allergic reactions in humans and have been known to kill pets. These are just the 2 that I know of. Is Singapore Plumeria flower edible. I heard it is a cure for diabetes2. Since you don’t have an email listed, just letting you know Congrats! we’ve added a pic and your website to our Kids Books series just out today! I saw a edible flower called a bubble blossom on the food network, but I can’t locate it on amazon or on the web. Does anyone know where these can be sourced. I think you should clarify that Calendula are not aka Marigolds, they are aka Pot Marigolds or English Marigolds. The difference is important because Calendula, a member of the daisy family, are edible while most Marigolds, members of the Tagetes family are not edible. Even the one you mention is questionable and to be used, if at all, with caution according to many sources. Thank you so much for such a comprehensive and informative site. Having all this information in one place is a boon to organic gardeners like me . In particular, may I say that your culinary recipes are quite innovative and exciting . They have provided a feast of ideas for my garden kitchen……. Once more, many thanks for your good work . Geoff , West Yorkshire, UK. I just read where peonie petals were toxic then on this site it says they are edible. Which is it please? You are correct there is a lot of conflicting information about Peonies. I would check with your medical professional, and gardening experts if you questions about consuming plants or flowers that you are unsure of. I’m working toward a masters degree in herbal medicine. My assignment for this week (the option I chose) is discuss a product that is made from flowers as opposed to the other parts of the plant. I have decided to write it on salad. Thank you for such a comprehensive list! I still have a lot of work to do but this is a great building point for me. I won’t have to go through a bunch of sites to pick plants to add to my salad paper!